• EMBASSIES IN ROME: more than 100 Representatives of Diplomatic Corp.
… Stefania is an outstanding teacher, effective and extremely pleasant. 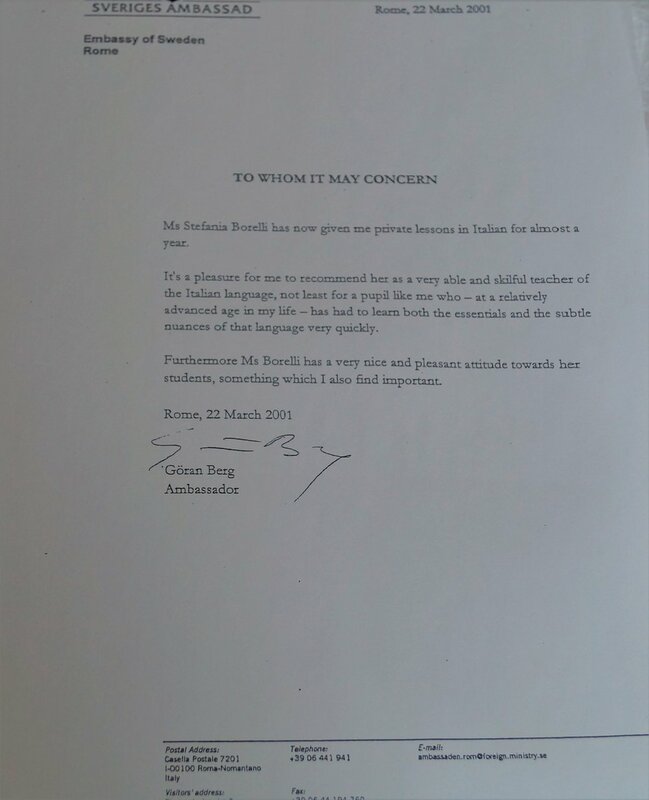 She is a fine teacher, who has introduced other members of this Embassy to the beauties of the Italian language. His Excellency Mr. Robert R. Fowler – Former Ambassador of Canada in Rome, Italy. I went on vacation to Europe for the first time in 2017 – with Italy being my only destination on the trip – and only being able to somewhat speak the survival basics that I learned in a tiny phrasebook. Not only was I heartbroken to leave such a beautiful country behind at the end of the trip, but I vowed to go back again with at least a working knowledge of the Italian language in order to have better conversations with my newfound Italian family I’d never met before (and to once again experience the Tuscan countryside). After returning from that first trip and registering for Italian lessons with Stefania, I never thought in my life that I would have learned and progressed as much as I have just over one year later! Stefania has more than exceeded my expectations as an Italian teacher. She doesn’t teach grammar and sentence structure just for the sake of having someone memorize it all and repeat it on command; she thoroughly explains why sentences are said the way they are, helps us remember how to say them and how to apply them to real-life scenarios. What’s more significant about her methods of teaching is her patience – learning any new language is always a challenge, and being patient to new students like myself isn’t something that can always be taught in a short period of time. Not only have Stefania’s resources, encouragement and experience helped me grow my confidence in being more comfortable speaking and understanding Italian, but thanks to her, my appreciation for the culture has also grown exponentially ever since the first lesson. I have thought about Italy every single day for over a year and continuously plan my next Italian vacation in my mind, largely in part thanks to Stefania’s lessons! (And yes, I went back to Italy 9 months after the first trip and confidently used what I learned!). Chez Stefania l'art d'enseigner est inné. Elle sait simplifier ce qui semble compliqué, reprendre patiemment les explications là où il le faut et faire aimer ce qui est arride. En compagnie de Stefania, la grammaire devient un jeu et la langue une belle découverte. On y apprend à bien communiquer bien sûr, mais l'on s'éveille surtout à un monde riche en histoire et culture. Stefania aura été pour moi une belle découverte. Grazie mille! "I am very fortunate to have met Stefania, she is an excellent teacher who makes learning a new language a very enjoyable and fun process! I had been learning Italian on my own for a while but from my previous experience with other foreign languages, I knew it could only get you so far - if you want to make a real progress you need to start learning with a professional and ideally, to be able to practice with a native speaker. Luckily for me, Stefania is both of those things! I started taking private classes in preparation for my trip to Italy and right away, I could see the progress and feel confident that I can now make simple conversations and understand what people are saying. I enjoyed our classes enormously! While practicing, we chatted about almost everything – from the weather to our favorite recipes, books, travel ideas, you name it, and before I knew it, I was speaking Italian. It is an amazing feeling and I didn’t only learn the language, I also learned a lot about Italian culture, food, places to visit, things to do and souvenirs to buy. Stefania is very patient, encouraging and attentive teacher, she would ask you questions and make you talk and correct all you mistakes until you get it right. I absolutely recommend Stefania to everyone who wants to learn Italian!" . Stefania is simply and truly an amazing Italian teacher!! Her knowledge of languages, passion for the Italian culture, and genuine efforts to help you reach your goals, along with her charismatic personality is an absolutely wonderful and exciting way to learn. … and mamma mia, she has a lot of patience!. If you are serious in learning Italian, you have found a real gem in Stefania. As a second generation Canadian Italian, I have always been frustrated that I never learned Italian as a child. So it has always been a goal of mine to learn it, however after some unsuccessful attempts in university I had become discouraged. Learning a language is never an easy process and it takes a lot of commitment on the part of the student. Yet after my trip to Italy a few years ago I had rekindled my desire to learn again! Learning from my past experiences I knew learning in a traditional classroom was not suitable for me, so I was extremely excited to learn that Stefania offered private lessons! And I knew I made the right choice by choosing her as my “insegnante” after the first lesson we had together! She is the quintessential teacher to have when learning a language. She possesses countless resources to aid you, she makes learning fun and her passion is evident in her approach. But what is most important is she never gives up on you and is extremely patient, she wants you to be successful and that is very encouraging. I recommend anyone who is seeking to learn Italian to giveher a call because you will learn and have fun doing it, which is most important! Stefania offers Italian immersion. Rather than go to a grammar heavy night class at university I wanted to lean from a person – not a book. As soon as we walked in the front door she was speaking in Italian. The textbook is completely nella bella lingua. The more I laughed in Italian the more I thought in Italian. Our classes focused on all the things that you can’t really do by yourself at home: dialogue, someone listening to you reading out loud and correcting mistakes, listening to a native speaker and repeating after her. I took the class with a fellow my age and it was a real challenge to dialogue with each other. But the will to learn was there in a way that often isn’t in a classroom setting where people are more self-conscious or just need a credit. When we’d get confused we’d look to her for help like kids in distress. Then she’d graciously come with motherly reassurance and reinforcement. I recommend Stefania to anyone who wants to learn a language naturally, faccia a faccia. “When my husband and I started planning a trip to Italy, I knew that I wanted to learn to speak Italian. I wasn’t really sure what to expect from Stefania’s class. And I wondered if I might find it intimidating to be in a room full of strangers, messing up a new language. But what I found was a welcoming and encouraging environment, with one of the most passionate people I have ever met at the helm. Stefania’s profound love for her country and her language is absolutely infectious. And her constant encouragement of us – and her patience in listening to us struggle through her beloved language – is a great motivator for me as I work on improving my Italian. She encourages us to be brave enough to speak out in Italian, even if we make mistakes as we do so. I am about to begin my third course with Stefania, and I look forward to seeing her every week. It is such a great way to use a part of my brain that I never tap into. But more importantly, it is a great way to get to know a beautiful culture. Stefania’s class is not just about learning a language. It is an entire cultural experience. We can’t thank you enough for the fabulous pre-show you gave at our recent showing of the movie Roman Holiday! You completely entertained the crowd, and were a great enhancement to the experience. Please accept our gratitude. “Having taken Italian lessons with Stefania these past two years, I can honestly say that she is the consummate professional. When you take knowledge, expertise and experience, and combine it with deep passion for your work, what results can’t be anything but memorable. And entertaining too! Which is why I enjoy working with Stefania and why I look forward to every Italian lesson: she truly makes learning fun. and your emails. It is a great break for me to be around the company of such wonderful people. Volevo scriverti per ti ringraziare. Fa già una settimana che siamo in Italia, e sto parlando con i residenti, con i camerieri, con i impiegati alle alberghi–con tutti–in italiano! Certo, ci sono qualche volte non capisco tutto, o che cerco la propria parola. Ma con altri lezioni, parlerò un giorno, come un vero italiano. “When I decided that I wanted to begin learning Italian, I was not sure what to expect. Coming from a Spanish speaking background, I had always been able to understand Italian quite well, without much effort, and I was not prepared for the fact that learning to speak would be much more challenging. For this reason, I can honestly say that I could not have asked for a better teacher. From my first day of class, Stefania Borrelli has been very gracious, understanding and friendly. In these five months of taking individual classes from Stefania, I have found her to be an extremely patient teacher, who is willing to accommodate her lessons to the needs of her students. Stefania’s ability to both simplify linguistic concepts, when necessary, as well as to analyze subtle nuances has made learning from her a pleasure. I truly appreciate her willingness to ensure that she answers thoroughly any questions that I may have. This has definitely made the learning experience so much more effective. I believe that this attention to detail comes, not only, from Stefania’s passion for her language and her culture, but the personal care she has for her students. Moreover, Stefania’s broad range of knowledge, her education and experience have made speaking and writing in Italian very enjoyable. Not being around other native Italian speakers, most of the time, has necessarily required me to make a greater effort to communicate in Italian; therefore being able to combine this with other interests has made this challenge much easier to face. Whether discussing film and culture or religion and philosophy, Stefania has made learning Italian a dynamic and enjoyable experience. 1. When you are correcting/helping me with speaking I like how you keep the discussion going. I must say I have not experienced this in the past so this is definitely fantastico per me! 3. and last but not least- I liked that we spoke about things that are important to me, ie my time in Roma, and a little about my work. It is a pleasure to speak on behalf of Stefania Borrelli and the Italian Language course that she teaches . I grew up in a mixed Italian, French and English family. I was fortunate to live close to my grandmother and I grew up listening to her and her friends speak Italian, without ever understanding a word of what they were saying. As an adult, my understanding of the language improved but I was not able to put a sentence together. Asking for a slice of pizza was a challenge in itself. My one dream was to be able to speak fluently in Italian but never quite found the right venue, until Stefania Borrelli. I eagerly signed up for the beginner class and was a little nervous on the first day. The moment I walked into the class, Stefania welcomed me and immediately put me at ease. Her approach to teaching is very upbeat and she walks her students comfortably through the material she has prepared for beginners. Her love for Italy is infectious and listening to her speak about the culture, the food, the ambiance of Italy and more specifically Rome, I was ready to book the next flight out of Ottawa, if only to feel and smell that Italian flavour. The material we used in her class was concise and easy to follow. She encouraged us to speak and to ask questions at any time during the lesson. As we fumbled through our sentences, Stefania understood our frustration and had the ability to extract from us the message that we were trying to convey. As a professional, she gets to know her students and gives them the confidence needed to succeed. Stefania takes us beyond the classroom and invites us to the many activities that she has organized, Italian Style, of course. The variety of workshops, the summer movie nights are examples of the many venues that she hosts for her students so that we can begin to experience the way that the true Italians live. It is a pleasure to continue taking her classes and I intend to immerse myself in as many courses, workshops and perhaps even trips that she may organize, so that I can get to know a little bit more of my heritage through her love of being Italian. I have just finished taking my first course in Italian Beginners with you. It was a most enjoyable experience. Your love and knowledge of the Italian language and culture is evident in the way you so carefully prepared the course material and activities and so expertly and lovingly shared all of it during class and with your online availability. It ended quite too soon. I have learned so much and am more enthusiastic than ever to master this beautiful language. Un bel di . . .
… With her vast experience, Stefania is well familiar with the education-material from the leading European and Italian language schools. The lessons that she has given here at the Embassy, have provided her students with a very important bridge between their earlier studies and a more profound understanding of the Italian language. Besides the high degree of professionalism that she shows in her work, Stefania also has a very open and generous personality. With her multi-faceted personal interests and positive look on life, and her willingness to share, she is a very stimulating acquaintance. Mr. Fredrik Jorgensen – Former Minister at the Embassy of Rome, Italy. I took Italian language classes from Ms. Stefania Borrelli for 3 months. During that time she taught me with dedication and I found the classes interesting and fun. At the end of 3 months, she was no longer just a teacher but a friend well. I have no hesitation in recommending her to anyone who wishes to learn the Italian language in a novel and fun method. Her Excellency Dato’ Lily Zachariah – Former Ambassador of Malaysia in Rome, Italy. Ms. Borrelli taught Italian language to me and my wife, with professional skill and training, and we were really satisfied of the results we obtained. Stefania Borrelli has provided Italian lessons to my partner and myself on a regular basis for almost two years. We found Ms. Borrelli to be a very good teacher who was able to deliver well-structures lesson tailored to our particular needs. 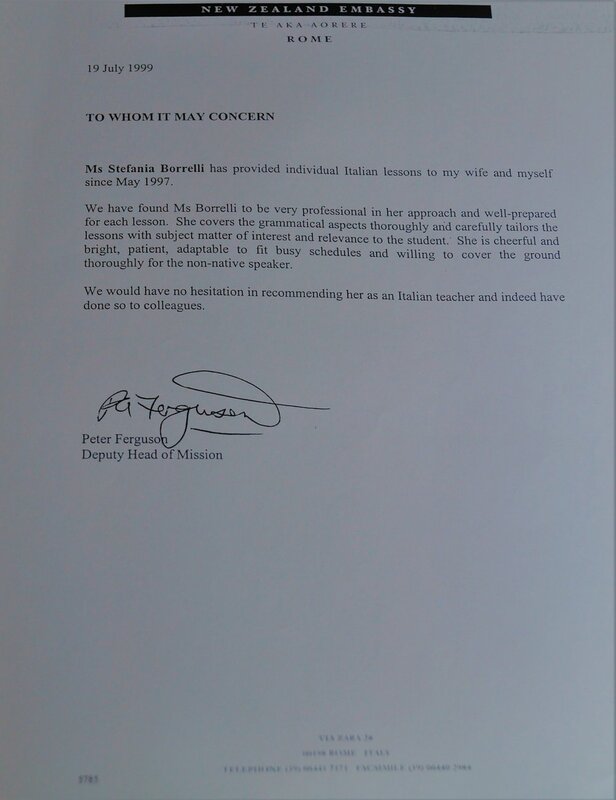 Ms. Borrelli was also casually employed in the Legal Affairs section of the Australian Embassy for six months. Ms. Borrelli always impressed me as a reliable employee and it was also useful that she regularly did extra research (in her own time) on topics that were of interest to the Legal Affairs section. She has a friendly disposition and a likeable character. Ms. Stefania Borrelli has provided individual Italian lessons to my wife and myself since May 1997. We have found Ms. Borrelli to be very professional in her approach and well-prepared for each lesson. She covers the grammatical aspects thoroughly and carefully tailors the lessons with subjects matter of interest and relevance to the students. She is cheerful and bright, patient, adaptable to fit busy schedules and willing to cover the ground throughly for the non-native speaker. We would have no hesitation in recommending her as an Italian teacher and indeed have done so to colleagues. 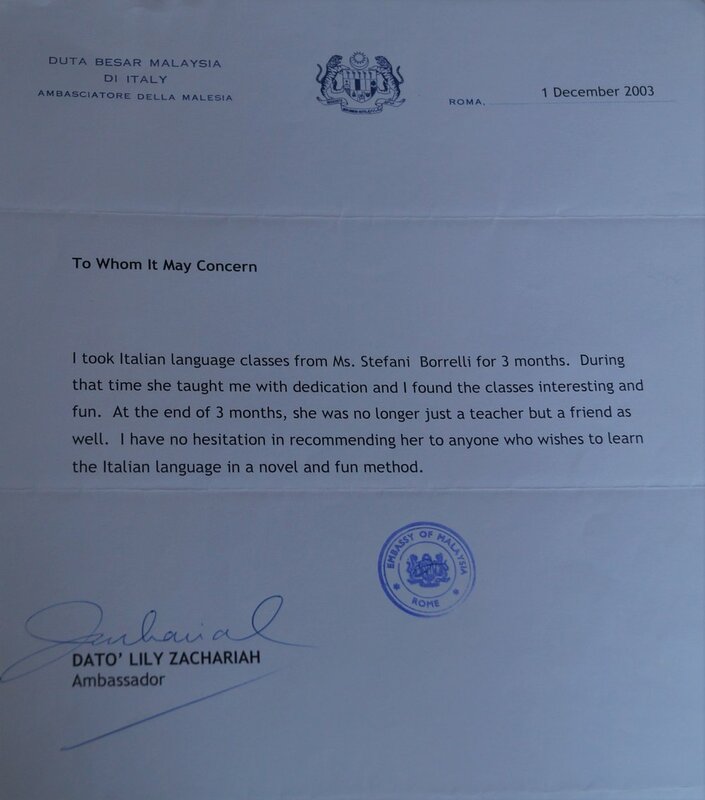 Stefania Borrelli has been a teacher of Italian language to the staff of the Malaysia Embassy in Rome and to me personally. I am delighted to write a testimonial for this fine young lady who has been a dedicated, reliable and efficient teacher. I have found her to be an effective teacher who is able to modify her methods according to the needs of her individual student’s ability, cultural and language background. I write this testimonial with all sincerity and assure you that you will enjoy her pleasant, cheerful and friendly nature. She is also interested in introducing new comers to Rome to the rich cultural and musical event in the city. I do not hesitate to recommend her as a young lady of the highest calibre. Datin Christie Vengadesan Wife of the Former Malaysian Ambassador to Italy . Je recommande sans hesitation Madame Stefania Borrelli qui m’a enseigné l’italien durant une année. Après seulement un an, j’ai amélioré de façon significative mon expression orale, mon expression écrite grâce aux leçons de Madame Borrelli qui étaient bien structurées et adaptées a mon niveau et au type de travail que je fais. Elle n’hésite pas par example à préparer du matériel de sa proper initiative si elle juge que le matériel pédagogique standard ne répond pas aux besoins spécifiques de l’édudiant…. Il me fait plaisir de recommander Mme Stefania Borrelli comme professeur d’italien pour tous les etrangers souhitant bien s’integrer a la vie italienne durant une affectation a Rome. En effet, l’Ambassade du Canada a utilise les services de Mme Stefania Borrelli comme professeur d’italien pour plusieurs diplomates qui ont confirme sa competence professionnelle, sa faculte d’adaptation aux besoins de chaque etudiant et son interet personnel dans la reussite de chacun. Ayant etudie italien avec Mme Borrelli pour 2 ans, je peux temoigner que mes capacites en italien se sont ameliorees grace aux repetitions, aux exercises appropries et au patient suivi de cet excellect professeur. Elle arrive a l’heure, bien preparee pour chaque lecon avec des objectifs concrets et realistes. Elle est consciente des imperatifs du travail et accepte de changer les horaires pour repondre a nos besoins. Sa patience est expemplaire puisu’elle continue de bonne grace a corriger les memes erreurs de pronounciation, de syntaxe ou de grammaire, de facon a ce que nous puissions non seulement nous exprimer en italien, mais encore le faire avec elegance selon le niveau de langue approprie. Je n’hesite pas a recommander M.me Stefania Borrelli pour toute personne souhaitant apprendre bien et rapidement italien. Ms. Stefania Borrelli has given me Italian lessons ever since I arrived in Rome almost 2 years ago. Ms. Borrelli is a very dedicated teacher who loves teaching and enjoys the company of foreigners. She is well-read and has a great knowledge of Italian culture and habits. Thanks to Ms. Borrelli I have been making steady progress in learning Italian. Due to her very pleasant company and great sense of humour I always look forward to my lessons. Stefania has impressed us with her professionalism, punctuality and commitment. Not only have her lessons been instructive and well-structures, but entertaining and lively. She has a strong understanding of the kind of problems an English speaker of Italian is likely to encounter and is highly adept at correcting bad habits picked up by foreign speakers. I can highly recommend Stefania, her skill and open personality would be an asset to any firm, institution or private student. Stefania Borrelli is an excellent teacher. She customized an Italian language program for me, was attentive to my questions and exceedingly well prepared with materials and examples relevant to my situation. Based on my experience, any Italian language student would be pleased with the results obtained from studying with her. I have been studying Italian with Stefania for over a year now and can honestly say that the experience has been one of the great joys of my life. With Stefania I am not only learning grammar and spelling, I have learned how to speak Italian – and not just academic/foreign student Italian, but Italian the way the Italians speak it – I have learned colloquial phrases and expressions, who’s who in Italian cultural life, how Italians think and live. Stefania is the ideal teacher. She is patient, encouraging, kind, and very very skilled. In addition, she has been living in North America for only a short time, so she is still very connected to real, daily life in Italy. I have gained not simply a language, but an immersion in a culture and history that have fascinated me throughout my life. I have also gained a friend, whose willingness to abandon the books and just chat is a real treat, and whose rigour in explaining the important details is rewarding. I highly recommend Stefania to anyone interested in learning Italian and in discovering the Italian way of life.